Signs of our departed loved ones telling us all will be well and that there is life after death, if we only have the faith and willingness to believe. For Mom, it’s a ladybug. When she died 25 years ago from breast cancer at the age of 59, (see “Remembrance”), Mom left behind a husband, 2 daughters and 3 grandsons. Speaking for myself, her “baby,” I was in total shock, having spent the entire month of February driving to the hospital after work and watching her suffer. After her death, I was totally drained physically, emotionally and spiritually. One of the first things we did as a family without Mom was to drive 8 hours to my best friend’s wedding in North Carolina, the wedding that Mom promised to bake her delicious Italian cookies for (what is a wedding without countless trays laden with homemade cookies made from recipes handed down through the generations?). Needless to say, my family was happy for my friend who called my Mom and Dad her “adopted parents,” but the absence of Mom was a raw ache, an emptiness, a longing that went unfulfilled. During a rest stop, Dad, my sister and I stood stretching our legs before getting back into the car for the long ride home. As we spoke about how much we missed Mom, a ladybug landed on Dad’s shoulder. 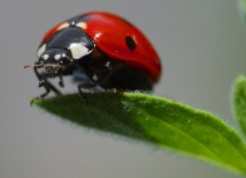 Mom had always loved ladybugs; if one was inside the house, she would bring it outside and place it gently on a flower. If one landed on her, she would simply let it stay put until it flew away. Mom knew that ladybugs were dedicated to the Blessed Virgin Mary and had been called the “Beetle of Our Lady,” its name linking itself to spiritual ideals and mothers. To her, that sent a powerful message of devotion and love. A ladybug on Dad’s shoulder…while we were talking about Mom…at our first outing as a family without her. Each of us looked at the ladybug, looked at each other, and without saying a word, started to cry. Somehow Mom found a way to let us know that she was with us. Ever since then, in the past 25 years, ladybugs have visited my Dad, sister and me when we most needed the comfort. Dad would call us up on Mom’s birthday and mention that a ladybug was on his morning newspaper, or in the bathroom during the Christmas holidays – Mom’s favorite time of year – when he most missed her, or on the passenger seat of his car when he had a doctor’s appointment. If my sister was going through a difficult time, even though it might be the dead of winter, she would call me up and say, “Guess what I’m looking at right now, on my windowsill?” and I would answer, without missing a beat, “A ladybug.” Mom came through again and again. After Dad died and I was particularly sad, having to make some big decisions without having either parent to ask for advice, I found myself driving to work and saying out loud, “I really need a lady bug sighting.” I thought of my ladybug collection at home that reminded me of Mom – pins, coffee mugs, journals, bracelets, note cards – but they just weren’t enough. I really, really needed her. As I slowed for one of the three stop lights in my town that foggy morning, I noticed something strange about the car in front of me. I blinked, then got a better look as I came to a top. It was a Volkswagen Beetle automobile. I’d gotten my driver’s license in one when I was 17 years old. But that wasn’t why I smiled. The Volkswagen Beetle was a red one with huge black spots painted on it. A car painted to look like a ladybug idling at the stop light. The ladybug sighting that I just asked for out loud – big enough just in case Theresa missed it. For Dad, it’s a dragonfly. Following Dad’s funeral Mass last year, we all proceeded to the mausoleum where Mom was buried. As my sister and I, our immediate family, and the rest of those who had come to pay final respects to Dad entered the marble building, for some reason, my sister turned around and looked at the wall of windows that covered its front. Just then, a beautiful dragonfly flew in and landed on the framework of the door. Quite large, it was a beautiful, iridescent blue (Dad’s favorite color, as well as the color of his eyes). It simply rested there, motionless. A cousin of mine turned to my sister and asked in a voice tinged with wonder, “Did you see that?” as they looked at the visitor. My sister nodded, unable to speak. When she told me about this later, I had no doubt that we had just received our first message from Dad. 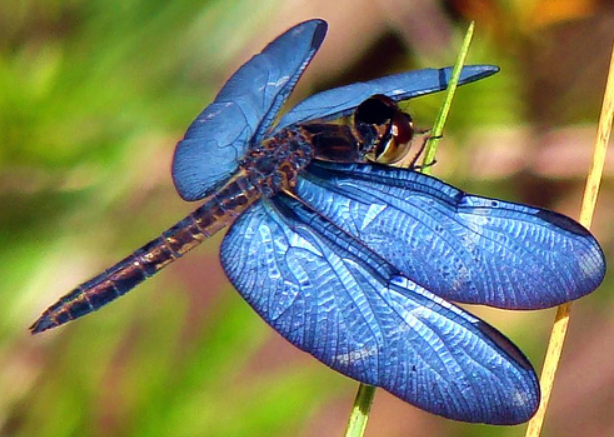 In choosing the dragonfly for his sign, Dad chose a symbol of light, one of a select few creatures that are supposed to carry a deceased person’s energy to their loved ones, often seen as a harbinger of change. This week, the final chapter in the managing of Dad’s estate took place when we had the closing for the sale of his house. My sister and I hoped that we would find a young family to bring the house alive, to transform it once again into a place of brightness and love and happiness. We got our wish when we met the couple who bought it, along with their young daughter. The conference room was filled with people – attorneys, realtors, secretaries, the buyers (the family) and the sellers (my sister and me). It was bittersweet – a relief, after a year, to have this last task completed, yet also very sad, to have this last task completed (see “Who Will Remember?”). As we sat across the table from the family, my sister addressed the harried and exhausted looking mother, who had just finished telling us that they closed on the sale of their own house late the night before. “Your sweater – are those dragonflies on your sweater?” The woman stretched the front of the garment out so that we could see its print. Multiple dragonflies fluttered across it in bluish-purple beauty. My sister and I both started to cry. As we brokenly explained what/who the dragonflies represented, the woman’s eyes filled with tears. “Well, I guess we know this was meant to be,” she softly commented, pulling her sweater more closely around her, almost like a hug. She was correct. Dad was here to say that his house was being passed on to the right people, and that he was with us always. I would like to say a ladybug landed on the desk at the same time, but that didn’t happen. The dragonfly was enough. Thank you, Mom and Dad, for sending your love. Continuing bonds can never be broken. There are signs. Our loved ones never leave us. We must simply open our eyes and our hearts will be filled. This entry was posted in Parents and Parenting, Personal Musings, Thursday Re-View. Bookmark the permalink. THANK YOU SO VERY MUCH FOR SHARING!!!!!!!!!! Thank you for your kind words, Maureen. Thank you for sharing that, Theresa. Full of hope and light. You’re so very welcome, Don. Thank you for reading and commenting. Beautiful, this brought tears to my eyes. Thank you so much for sharing! It is so wonderful how our loved ones manage to reach us through the natural world, and through signs and synchronicities. With my grandmother it was butterflies. Even our beloved dog managed to reach us after his passing: through other dogs! Beautiful post Theresa, thank you so much for sharing. I agree. There are always sign if you pay attention and they come in all different forms. Nice post. Beautiful post, Theresa! Ladybugs serve the same purpose for me as well. My grandmother loved them and I’ve had many synchronistic incidents where I’m certain she’s sent them as a sign for me…and if it isn’t ladybugs, it’s butterflies. Isn’t synchronicity wonderful? Beautiful and poignant, Teresa. Our loved ones never really leave us, do they? It’s a brown moth for my wife around the time of her Dad’s passing. There are always signs – wonderful, Laurie. Then there are those that come back and startle the heck out of you.